With over two decades of experience in the logistics trade I’m now sharing my insights, awareness and gusto for the home delivery industry, specifically of over-dimensional goods. I’ll be delving into various issues facing stakeholders and highlighting innovations that benefit the home-delivery consumer. Online retailers selling oversized items continue their growing pains as consumer expectations run high, indifferent to the shipping complexities on the back end. AKA your end. For those of us who have been in the industry of delivering over-dimensional products to consumers, it’s no surprise consumers are confused why some items, (parcel sized items) arrive at their homes so quickly and without issue, while oversized items (goods larger and heavier than can be delivered by parcel delivery organizations) take longer and can be fraught with problems. All parties involved want the same thing; smooth, timely fulfillment with transparency throughout the process. The last one is the most important and useful in managing consumer expectations as we’ll dig more into in a moment. This consumer confusion stems from their successful experiences with the parcel shipping industry and major E-commerce portals (AKA the Amazon effect) combined with their lack of understanding of how the process works to move over-dimensional products through the logistics systems in this country. The truth they don’t know is, there’s no established, reliable, coast-to-coast shipping network to bank on for big-box items. Here are the top four pain-points we have to heal for the future of E-Commerce. The over-dimensional delivery consumer is price sensitive. Not only are they confused about the service times but also the cost of delivery when purchasing over-dimensional items. In a survey of 4,700 consumers, 15% said they made the decision to not purchase furniture, appliances, and electronics because of the cost of delivery. 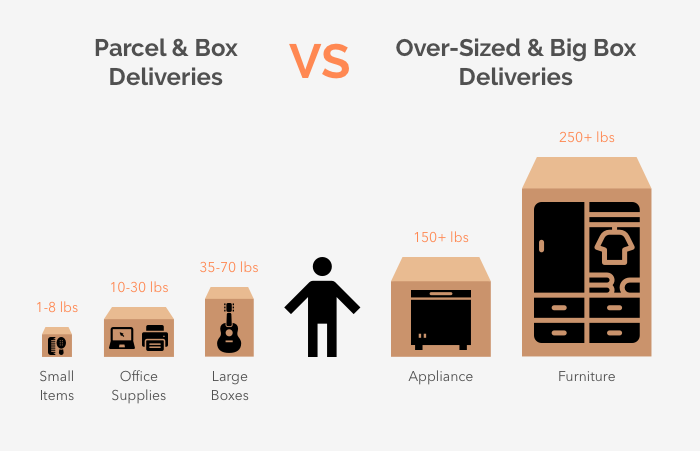 The old adage “freight moves freight” is completely accurate when comparing parcel delivery to over-dimensional delivery. UPS & FedEx deliver far more packages each day than all the over-dimensional companies combined. In addition, the typical single parcel driver makes more deliveries in a single hour (avg. of 18) than an over-dimensional delivery team makes in an entire day (avg. of 10). 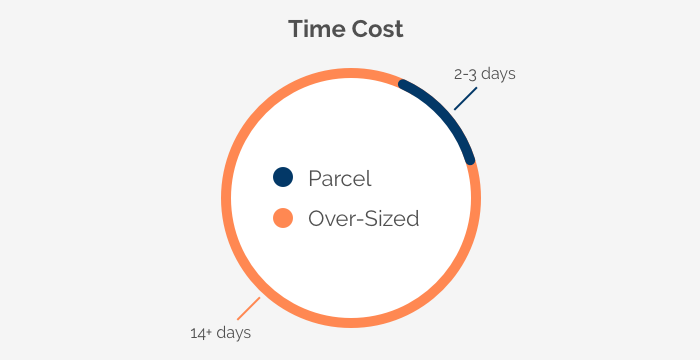 This directly affects the overall time and cost required to make those bigger deliveries. With most over-dimensional products requiring 10+ days to deliver (many require 14+ days), it is no wonder consumers have a somewhat negative viewpoint on the delivery service they receive when ordering these items. Most eComm retailers are striving to achieve a 7-day delivery window, but the industry has struggled to achieve this on a consistent basis, much less meeting consumers delivery expectations of a few days or less. The eComm consumer expects their products to arrive at their home or business within a few days of their order. They expect, not only to have the ability to track their orders in real-time but to be notified as critical events occur (i.e. your order has shipped, your order will be delivered on day X, etc.). They expect the order will arrive in excellent condition and if there are any issues, they desire an extremely easy, efficient and low-cost method of resolution or return. As business owners, how do we combat and conquer these realities? I don’t have a singular, magic-bullet answer, the challenges are tough and won’t be solved completely anytime soon. But, by addressing each issue and researching them thoroughly, we can begin to create strategies to mitigate general negativity by being better communicators. Here’s a glimpse of my cheat sheet. Join us next time as we talk in-depth about these solutions and more to overcome the hurdles as we strive to achieve a higher level of service for ovesized deliveries. What does it take to make a team work? Leadership, experience and a unified vision of where the company is headed. A tool for every job be it Routing, Billing, or Customer Management we can help your business be better. Furniture, Health, Wholesale and more, see how our software can serve your sector. As our company grows, so does our reach. See how we’re expanding globally.